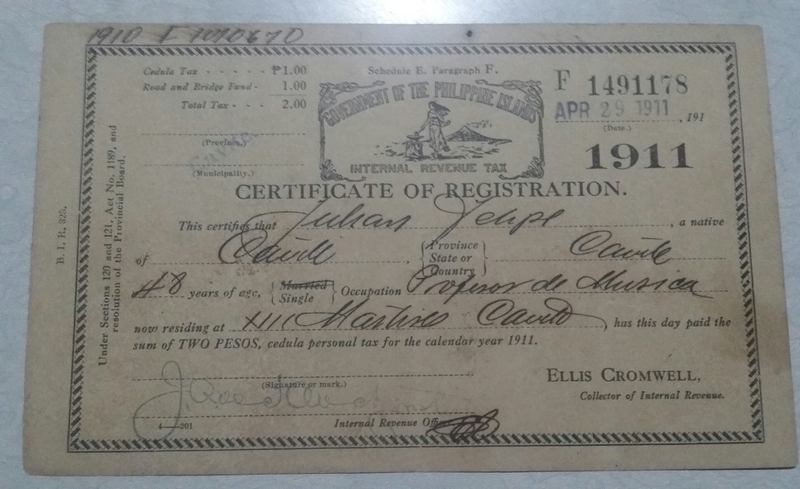 Julian Felipe was born on January 28, 1861 in Cavite City. His parents were Justo Felipe and Victoria Reyes. He was the composer of the Philippine National Anthem. It was known before as “Marcha Nacional Magdalo” now known as Lupang Hinirang. He was a dedicated music teacher and composer. Emilio Aguinaldo who was the President of the Philippines at that time appointed him as Director of the National Band of the First Philippine Republic in 1899. Both of them were from Cavite. 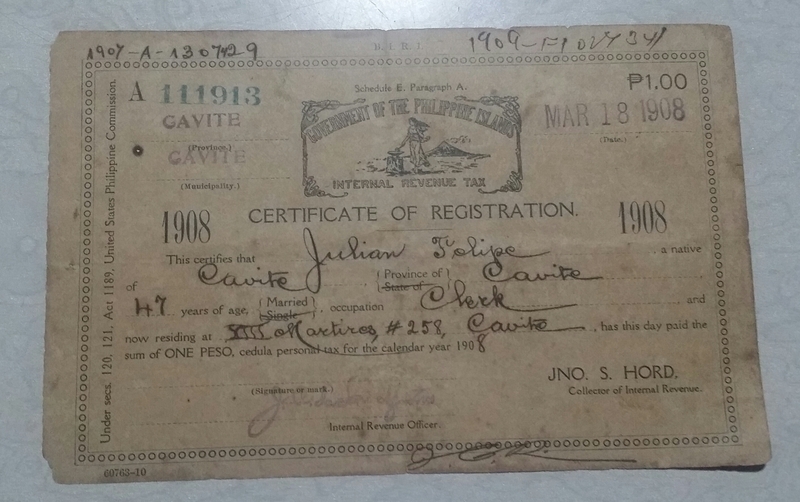 Julian Felipe being from Cavite City and Emilio Aguinaldo from Kawit Cavite. In his younger years he studied in Cavite and for his primary education he studied at a school on Binondo, Manila. Even though he was still young he showed his talents in music. be it the organ or the piano he can play it very well. When he was 10 years old Leandro Cosca was the who instructed him. He became an organist in St. Peter’s Parish Church through the employment of his second teacher a Recollect priest named Pedro Catalan. He also thought music at an all girl’s school named La Sagrada Familia. That was the start of his musical career and that was also the time he started composing songs. Just like any patriot he joined the Philippine Revolution in 1896. He was imprisoned in Fort Santiago in Cavite together with the 13 Martyrs of Cavite. The 13 Martyrs was sentenced to death, but he was found innocent and was later releasedon June 2, 1897. After the Philippine American was he was elected as a councilor in Cavite City. He also served as bandmaster of the US navy in May 1904. He died in Sampaloc Manila on October 2, 1944. 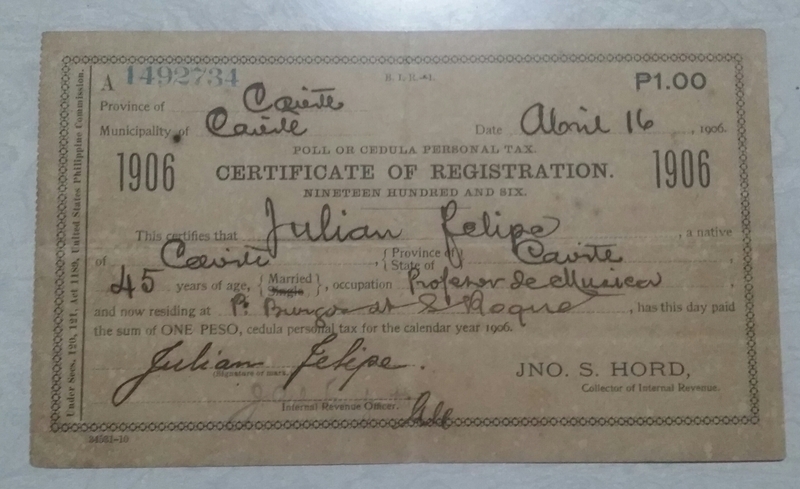 I was lucky enough to have a cedula or certifiacte of registration of Julian Felipe. I got it about 4 months ago. It first happened when i was in my junkshop when someone approached me. He asked me if I was buying antique and vintage things. I said yes, and he said that he had some old community tax certificates. I asked him what dates were the cedulas. he said that he had a 1906, 1908, and 1913 cedula. I was delighted from having to hear it. I asked him if he could show me the cedulas. He said that he will get it first at their house. After awhile he came back and he showed me the cedulas. I was delighted when i saw the the name of the cedula. It was JULIAN FELIPE the composer of our Philippine Natonal Anthem. He then asked me how much I was going to buy the cedulas. I said to him if he could come back since it is the first time that i saw a thing like those. When he left I called and message some of my picker friends regarding the price that I should buy the cedulas. One person said to me that I should buy it for the price that we were both comfortable. When afternoon came he went back to my junkshop and we then talked about the price. I planned of buying it by lot. He wanted me to buy it per piece. after some haggling we both agreed on the price and I paid him and I thought that that was the end of it. 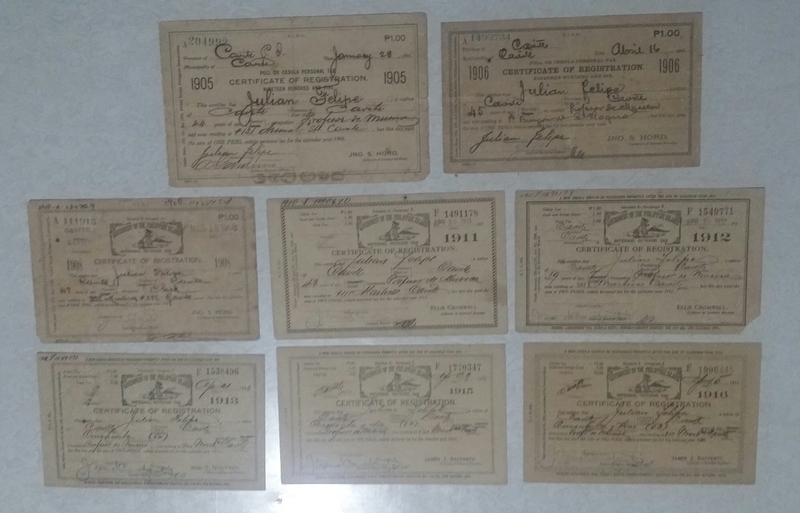 After a few days he went back to my junkshop and sold me 3 more cedulas dated 1911, 1915, 1916. I was really happy by having those 6 certificate of registration of Julian Felipe. 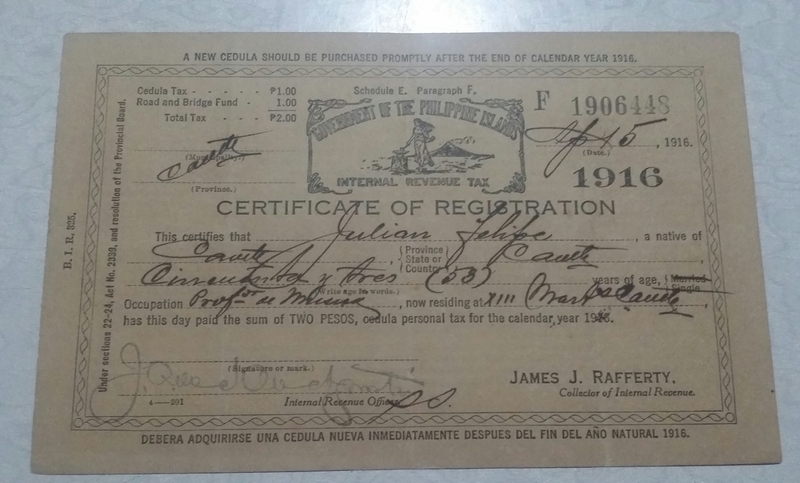 But lo and behold after a week, he went back again to my junkshop and sold me another 2 copies of Julian Felipe’s cedula dated 1905 and 1912. And he said that those were the last copies that he has. After that happened I asked around on where i could authenticate it. 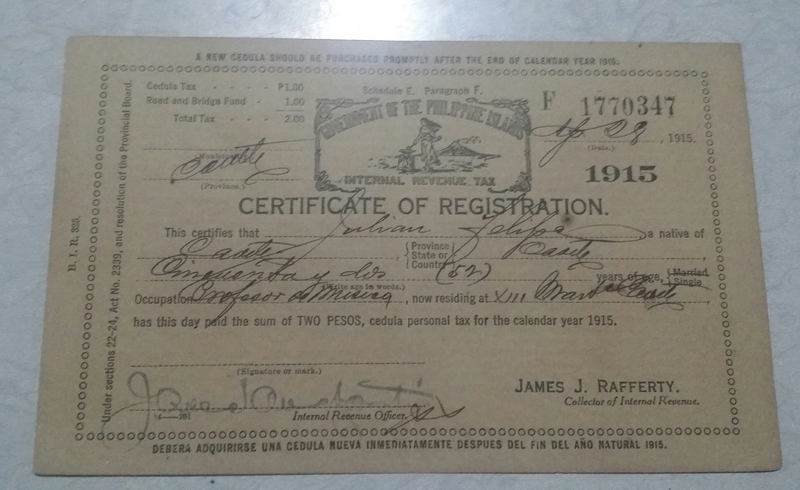 One of my picker friend said that I can have it authenticated in the National Historical Commission Of The Philippines. He even helped me on who to look for. The problem was when I got the appointment I was busy running my junk shop business and I can’t go to Manila. Until today I still haven’t brought them and have it authenticated. Hope that one of these days I can have a free time to have the cedulas authenticated. Out of all the 8 cedulas only 2 was signed by Julian Felipe. The 1905 and 1906 were the only ones that has his sign. Also 7 of the cedulas all has Professor of Music as his occupation. Only the 1908 cedula is different his occupation for that year is a clerk. Maybe that was the time he became a councilor in Cavite City. 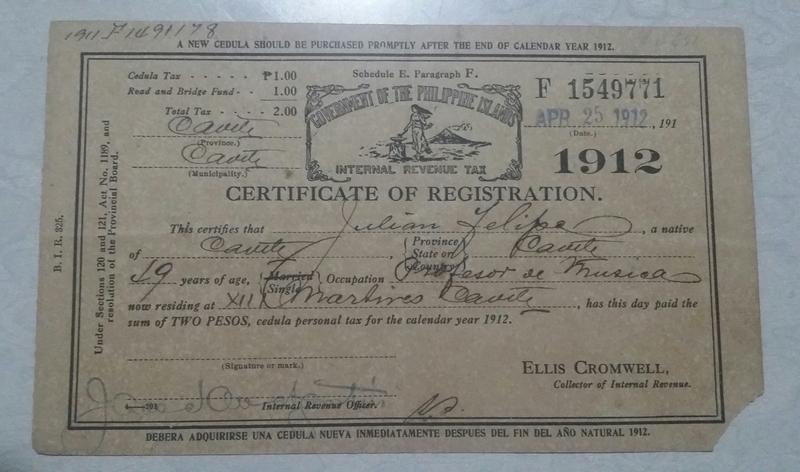 We can see that in 1905 he live in Arsenal street and in 1906 he lived in P. Burgos San Roque and for the rest of the cedulas he lived in 13 Martires, Cavite City. Also we can see that there is a difference in his age from the other cedulas. If we would base it on his date of birth which was 1861 . In 1905 he would be 44 years old and that is correct. For 1906 his age is 45. For 1908 it was 47. 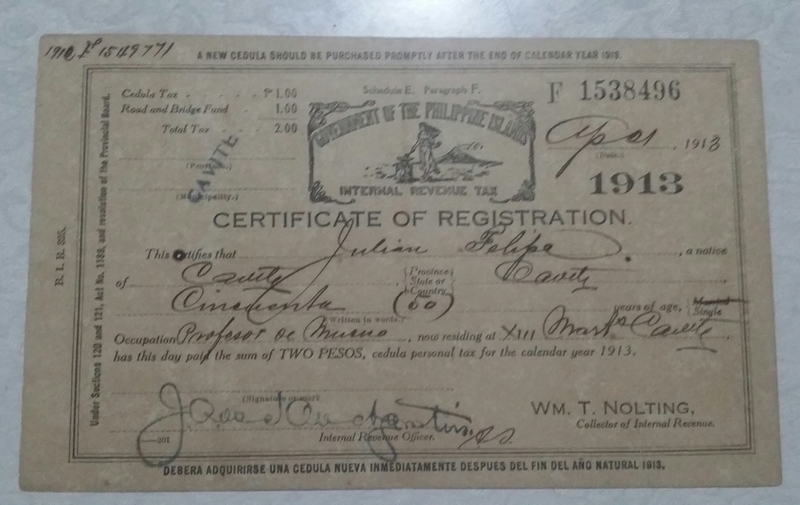 But for his cedula for 1911 his age is 48 and if we base it on his birth year he should be 50 at that time. and it goes on for the other cedulas. his age for the cedulas from 1911-1916 has a 2 year difference form his actual age if we base it on his birth year. I hope that someone can explain this to me. 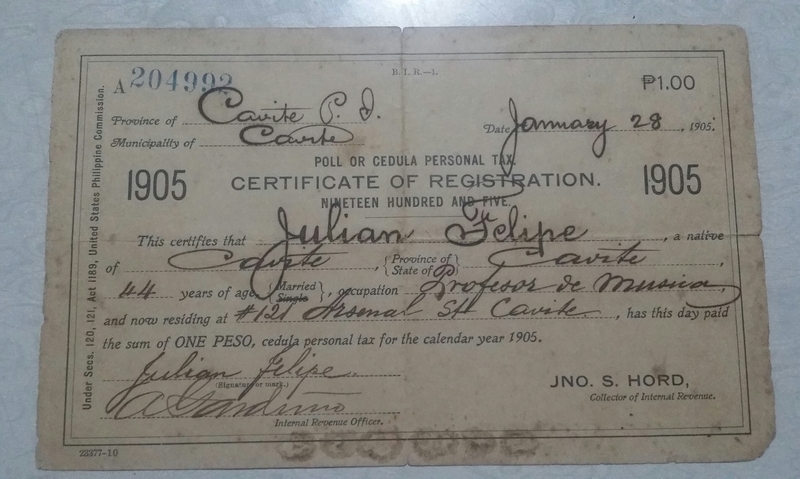 All in all I am happy that I was able to have a cedula of Julian Felipe and knowing that I have in my possession a Historical piece is fulfilling in itself. In case you are interested in selling one of his cedulas please let me know. My mobile no.are 09269996001 and 09496233333.